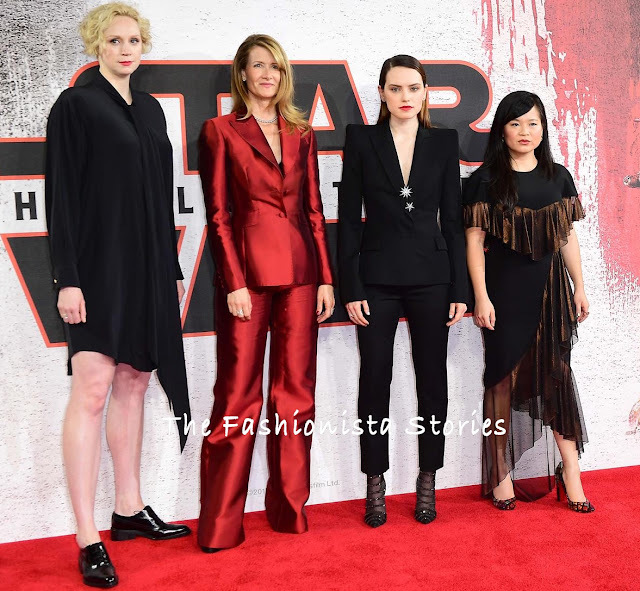 Following the London premiere, Gwendoline Christie, Laura Dern, Daisy Ridley and Kelly Marie Tran hit the red carpet at the 'Star Wars: The Last Jedi' photocall at the Corinthia Hotel yesterday(December 13th) in London. Gwendoline Christie kept it simple in a black long sleeve dress which stopped above her knees and featured a tie neck detail. I like that she opted for oxfords as they looked great with her dress. Laura Dern wore the red GABRIELA HEARST SPRING 2018 'Serge' silk-wool, notch lapel blazer with the matching wide-leg trousers. Laura's suit hit the runway in a different color and with tapered leg pants. I like Laura's custom version for her. Daisy Ridley was my favorite in this black two-piece MUGLER SPRING 2018 suit with a padded shoulder blazer and crop trousers. Keeping her interesting, silver star brooches were added to suit. She finished up with a complimentary beauty look, NEIL LANE jewelry and JIMMY CHOO heels. Kelly Marie Tran wore a CHRISTIAN SIRIANO FALL 2017 short sleeve black dress with ruffles in contrasting copper and a asymmetrical hem. If this looks familiar, that's because Cara Santana wore it back in July 2017. For me, this is not the most flattering dress on her. Also I wish her hair was completely off-the-shoulders.